Hitachi Healthcare Americas demonstrated its latest technologies at ASE 2018 in Nashville, TN on June 23rd – 25th. Committed to delivering solutions that help providers meet new challenges, Hitachi’s bed-to-the-report workflow sets a new standard for integrated solutions. The Lisendo 880, Hitachi’s premium 2D/3D diagnostic ultrasound solution delivers high quality imaging for your cardiovascular patients in any clinical setting. A true one-system solution for adult, fetal, pediatric and congenital patients, Lisendo 880 boasts HDAnalytics advanced analysis, HemoDynamic Structural Intelligence, an AI fueled automation workflow, and clinical reporting analytics. 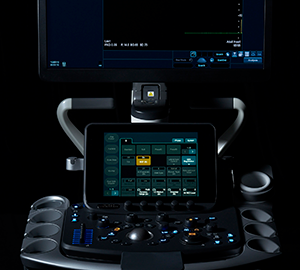 Lisendo 880 redefines the vision for cardiovascular ultrasound. Hitachi Healthcare Americas delivers best in class medical imaging technologies for healthcare providers. Hitachi’s MRI, CT and Ultrasound along with Agfa HealthCare’s Digital Radiology provide speed, comfort and quality for both physicians and patients and play an important role in the diagnosis and treatment of disease while driving social innovation into healthcare. Hitachi’s VidiStar image and reporting platform enables healthcare professionals to create value-based reports leveraging a cloud-based image management and analytics platform for improved communication across the healthcare organization. Physicians can grow their business into pediatrics, orthopedics and other unique patient populations while exploring new areas to compete. With an optimized and patient centric approach healthcare providers can deliver strong value into their communities and Hitachi will be there to support them. Our customer first philosophy compels us to make customer support one of the most important things we do. Innovating Healthcare, Embracing the Future. Hitachi, Ltd., headquartered in Tokyo, Japan, delivers innovations that answer society’s challenges, combining its operational technology, information technology, and products/systems. The company’s consolidated revenues for fiscal 2017 (ended March 31, 2018) totaled 9,368.6 billion yen ($88.4 billion). The Hitachi Group is an innovation partner for the IoT era, and it has approximately 307,000 employees worldwide. Through collaborative creation with customers, Hitachi is deploying Social Innovation Business using digital technologies in a broad range of sectors, including Power/Energy, Industry/Distribution/Water, Urban Development, and Finance/Social Infrastructure/Healthcare. More on the medical imaging device market in the U.S. can be found in a report series published by iData Research entitled the U.S. Market Report Suite for Medical Imaging Devices. The suite covers reports on the following markets: X-Ray imaging, MRI, breast imaging, CT imaging, ultrasound equipment, nuclear medicine imaging, and contrast agents and injectors. Reports also provide a comprehensive analysis including units sold, procedure numbers, market value, forecasts, as well as detailed competitive market shares and analysis of major players’ success strategies in each market and segment. To find out more about medical imaging device market data or procedure data, register online or email us at [email protected] for a U.S. Market Report Suite for Medical Imaging Devices brochure and synopsis.